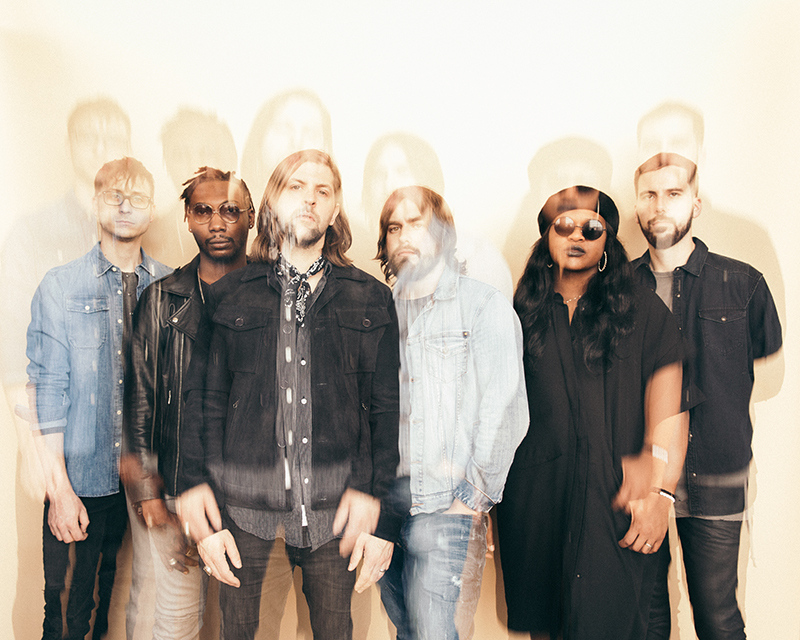 Welshly Arms has only been recording music together since 2013, yet this Cleveland-bred, blues-rock band already has a notable and growing resume. Citing Motown as a heavy influence, they’ve released three EPs, two full-length albums, and their music has been featured in promotional packaging for WWE (“Legendary”), and MLB (“Dirty Work”). With so much musical diversity among them, it’s no surprise that they have been embraced by their growing following. Despite having just wrapped an hour-long outdoor set, on a 95+ degree day in Chicago, the band’s founders, Sam Getz and Mikey Gould, were eager to chat about the band’s beginnings, touring, and creating their sophomore studio album, No Place Is Home. Jade Newton: With the extensive touring that the band does, how do you all practice self-care? 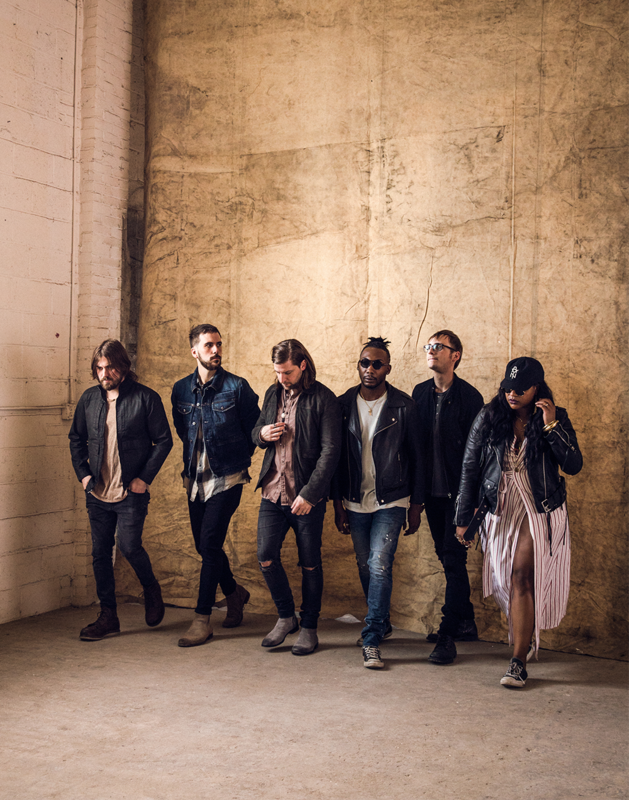 Welshly Arms: A lot of us have gotten into yoga recently; I think health and exercise is kind of a big thing in the band. A lot of people wake up in the morning and go to the gym, or they make weird smoothies [laughs]. Trying to keep the food sustainable – finding a healthy alternative to what’s in catering – is the biggest challenge. We’ve gotten better about our food choices and we’re learning to take better care of ourselves because we don’t want to change what’s happening on stage. JN: Touring takes a lot of work, but it’s also exciting. What are you all looking forward to the most about your fall tour? WA: We are single-handedly looking forward to being able to do OUR show – as much time as we need to say, what we need to say, design a real show, bringing together everything we need to do what we want to do. We’ve been doing the festivals – you just get up there and just do your songs. I love those too – there’s an excitement to it – but really getting to design our own show, we can’t wait. JN: Playing festivals versus playing your own show, what’s the biggest difference? WA: We’ve kind of learned that you never know what to expect; you just go out there and do what you do, and people are going to like it or they’re not. Festivals are beneficial for the bands because you gain a lot of new fans – people who may have never heard us before – hopefully they come to see us [on tour] and get an even bigger picture of what we’re doing. For the audience at these festivals, they don’t know how hectic it is – there’s a band before you and another band after you. So, I encourage people to come see a full show because at a festival you don’t get the full show. JN: You guys have been playing and making music for a long time, but not together, necessarily. How did Welshly Arms finally come to be? WA: We’ve all been buddies for a long time. We kind of went our separate ways during the college years, but then we ended up back in Cleveland after that. I threw together a little barbecue and invited them over because I just missed playing music with them. We had never played altogether at the same time, but we all knew each other and had played in different bands. I invited them over, threw a jam session and barbecue; we had so much fun that we ended up doing it again the week after that. WA: Little by little, we had some songs and recorded an EP. Our self-titled debut album was the real beginning of the band. We met Jon and Bri right before we finished that record and we brought them into the studio to sing a track; we loved it so much that we asked them to come to do our first big show in Cleveland at the House of Blues. We had so much fun playing on the stage with them that it was official after that; so that was like the birth of this band. JN: You rented a house to record your No Place Is Home album. What was the reasoning behind renting a house to work on the album instead of going into a studio? WA: [Renting a house to record the album] became a necessity because we started the band at my house. When we outgrew that, we moved over to Jimmy’s house, and then we outgrew that, but we needed someplace to put our studio. We’ve always been in love with the feel of making a record in more of a home setting – somewhere comfortable, where you have couches and a kitchen – we didn’t want to get away from that and get commercial space. So, we found this old house, kind of in our neighborhood, and we’ve been renting it for a little over a year now. We wrote and recorded our last album there. JN: Each band member contributes differently, which makes for a creative dynamic. Talk to me about that. JN: What do you think people love most about your music? What makes you stand out from other bands that are of a similar genre? WA: We do all our records on our own and the music we make is just true to what we like. From the beginning, we always wanted to do something passionate; a project that we were passionate about and I feel like we’ve done that. It’s six people who have a lot of different influences and the common thread is that we all like rock & roll, Motown, pop, and soul music.